Six students from the Department of Aerospace Engineering recently won scholarships from AHS International—The Vertical Flight Society. 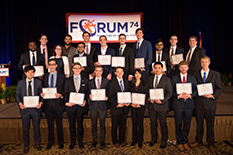 In the Bachelor Degree category, Peter Ryseck won the Professor Donald M. Layton Scholarship, which honors the former US Naval Postgraduate School professor and system safety expert. In the Master Degree category, Daniel Escobar, Bernadine Passe and Wanyi Ng received awards. Daniel Escobar won the Bob Lynn Memorial Scholarship, which honors the memory of the former Bell Helicopter executive and AHS leader for excellence. Bernadine Passe received the Eric Robeson Memorial Scholarship, honoring an outstanding engineer in the US Army’s Aviation Integration Directorate. Wanyi Ng won the Hal Andrews Scholarship, which remembers a preeminent Navy aviation engineer, advisor and historian. In the Doctorate Degree category, Seyhan Gul and Stacy Sidle were recognized with awards. Seyhan Gul won the Professor Marat Tishchenko Scholarship, honoring the former head of the Mil Moscow Helicopter Plant, and professor at Moscow Aviation Institute and University of Maryland. Stacy Sidle received the Dr. Alfred Gessow Scholarship, honoring a pioneer in the helicopter field at NACA/NASA and founder of the University of Maryland rotorcraft center. The VFF was established in 1967 as the philanthropic arm of AHS. Since 1977, the merit-based scholarship program has been a great success story: over 500 scholarships have been awarded since that time. The program has been greatly expanded in recent years, with the number of recipients nearly doubling in the last decade, and the total annual scholarship disbursement nearly tripling. Since 2012, more than 150 VFF scholarships totaling over $450,000 have been awarded—prior to this time, annual scholarships generally totaled about $33,000. Founded in 1943 as the American Helicopter Society, Inc., AHS International, The Vertical Flight Society, is now the global resource for information on vertical flight technology. The society advocates, promotes and supports global vertical flight technology and professional development.